In the Philippines (and in many place else, of course), militant and leftist groups have this penchant for holding protest rallies on various key occasions and events in the government, most especially during the day when the president is set to deliver his State of the Nation Address (SONA). SONA rallies are often the biggest (and bloodiest?) of all because this is one of the crucial times when their voices can best be heard as the entire country is focused on the event and related news reports. As the president speaks to the people about his programs, accomplishments, and plans, the rallyists often show their own programs and plans as well. In wanting the president to hear their calls, these militant groups often try their best to march towards the Batasang Pambansa Complex where the SONA is held; however, because the groups are often seen as threat to the president and other government officials in attendance, hundreds of policemen are deployed to stop them from reaching the area. 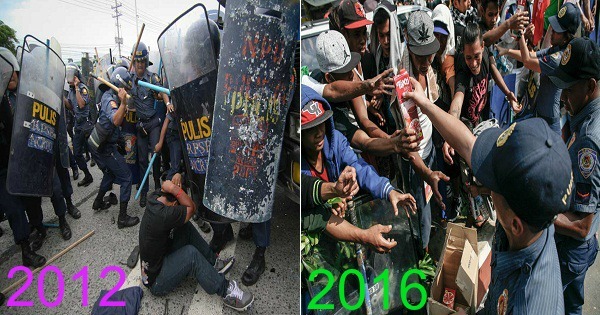 Over the years, these rallyists never actually won in their fight against the government and the police – and never set foot on the Batasang Pambansa because the riot policemen are well equipped to keep them from reaching the complex and causing destruction or whatever it is they are planning to do once they reach the place. But things have been different with the new president. This started during the inauguration of Pres. Rodrigo Duterte, the 16th president of the republic. Just a few hours after he was officially sworn into office, he invited the leaders of the rallying groups marching outside to come in for a dialogue. They were even served snacks – and the president joked and laughed with them! Then, for the first time in recent history, Pres. Duterte gave the go-signal for the rallyists to actually hold their rally near the Batasang Pambansa! But the public was unsure how the militants would go with their rally for Duterte’s first SONA, especially after news channels reported that thousands of leftist rallyists coming from as far as Mindanao are going to the rally. …Fast forward to the Big Day. Everyone was in for a big surprise because while the rallyists were there outside the Batasang Pambasa, rallying like they always do, the claimed that they were not doing a “kilos protesta” (protest rally) but a “kilos suporta” (support rally)! And the things that people and the police expected them to do, such as burning effigies and trying to march towards the Batansang Pambasa to force themselves in? Well, they did none of those! In return, the police did not blast them with water cannons or push them away with batons and their thick shields. Instead, they were actually greeted quite warmly… and even given snacks! Whoa! Change is here, indeed! While protesters were dispersed with water cannons back in 2014, the 2016 SONA demonstration was rather peaceful for everyone involved because everyone respected their designated spaces.